We have already covered the performance of the new AMD Radeon RX 480 GPUs for mining Ethereum, so it is time to see how the GPU performs with other popular algorithms. 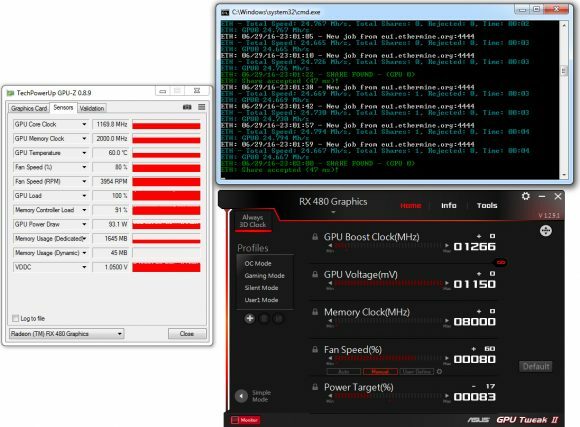 We have already mentioned that the RX 480 apparently has some issues running sgminer (at least under Windows), so we were not able to run tests with many of the currently popular algorithms, but it seems that many people missed that part. The good news is that there is now an updated version of the NiceHash Miner that apparently adds support for GTX 1070/1080 and RX 480. So we have downloaded it and ran the built in benchmark and you can see the results above as well as the fact that some algorithms still have issues apparently hence the 0 MHS results, but it is much better than before. 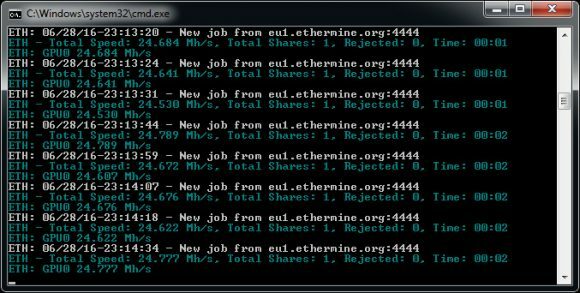 We have noticed that the sgminer that is being packaged and used for RX 480 now has some pre-built binaries for Ellesmere (RX 480) included. 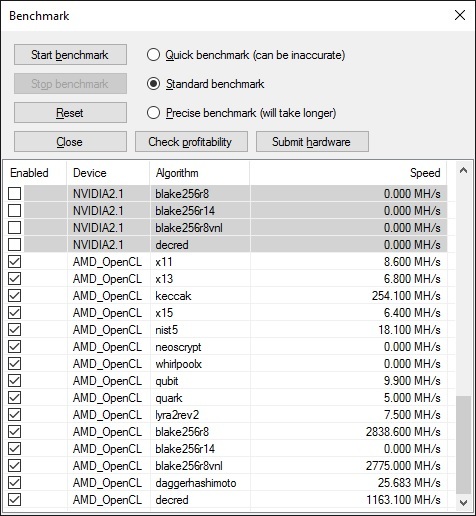 So even if you are not planning on using the NiceHash Miner on Windows, you still might get the sgminer-5-4-0-general from the bin folder and use it on Radeon RX 480. 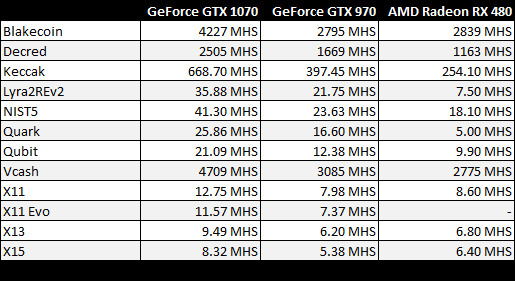 Here is a chart comparing the performance of a reference design AMD Radeon RX 480 from ASUS in the other algorithms apart from Ethereum to an Nvidia GeForce GTX 970, namely a Gigabyte WindForce OC model and a reference design Nvidia GeForce GTX 1070 from ASUS. The benchmark did not produce results for NeoScrypt, WhirlpoolX and Blake256r14 as you can see, so it seems that some algorithms may still have issues running on RX 480. 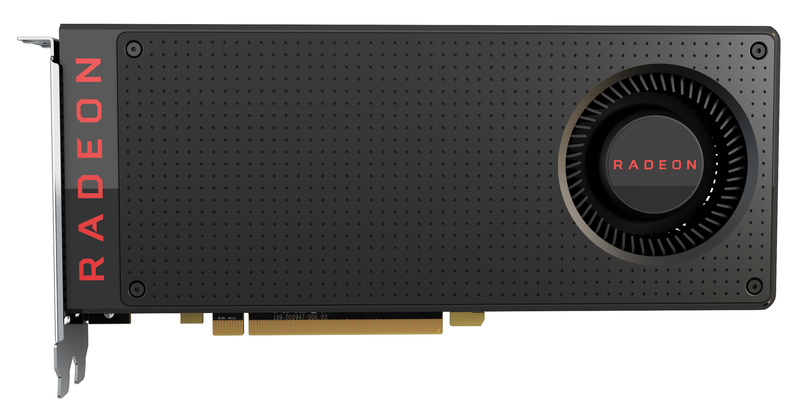 Also do note that the RX 480 has been around for just a few days, so there have not been any specific optimizations for the new Polaris architecture that it uses and further performance increases might be possible. The X11 Evo algorithm is not yet supported by the sgminer for of NiceHash, so there are no results as the dedicated miner is having trouble runnign on the RX 480 on Windows (we have not yet tried Linux). The pleasant surprises are in Blakecoin and the X-based algorithms where the result of the RX 480 beats with a bit what the GTX 970 manages to provide in terms of hashrate. 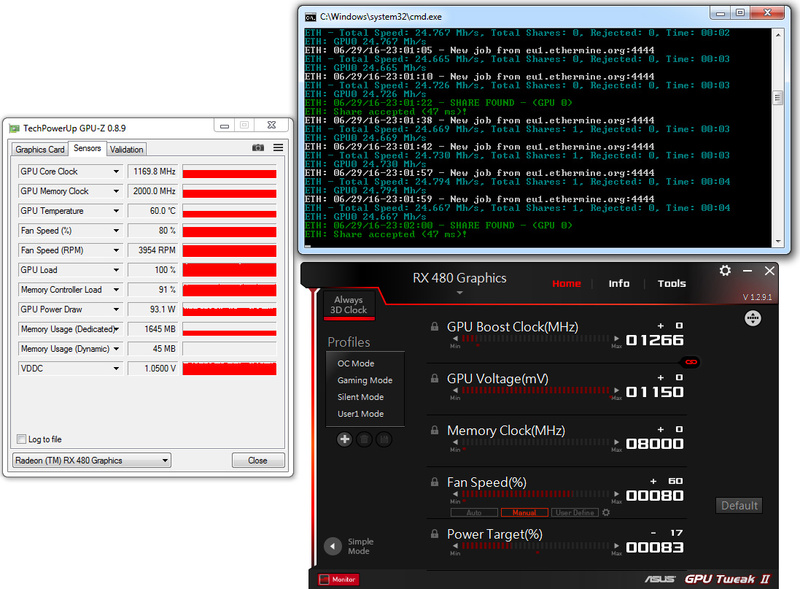 Unfortunately in the others the GTX 970 turns out faster than the RX 480 for the moment and the AMD card can definitely use some improvements in algorithms such as Lyra2REv2 and Quark for example. The GTX 1070 however manages to provide a significantly higher hashrate compared to the RX 480 and with a lower power usage than the AMD card. Again the RX 480 could get some tweaks and fixes and it definitely needs some and will most likely manage to catch up to the GTX 970, but reaching the GTX 1070 is probably too much to expect. We should not forget that the GTX 1070 is a significantly more expensive GPU than what the AMD Radeon RX 480 sells for, but still we did not expect doubled or almost doubled hashrate provided by the GTX 1070 in most algorithms. It seems that the benchmark results we get for crypto mining and the ones when using the RX 480 for gaming are pretty much the same (apart from memory intensive mining algos such as Ethereum) where the new AMD card manages to be on par or a bit faster than a GTX 970 in some of the cases.